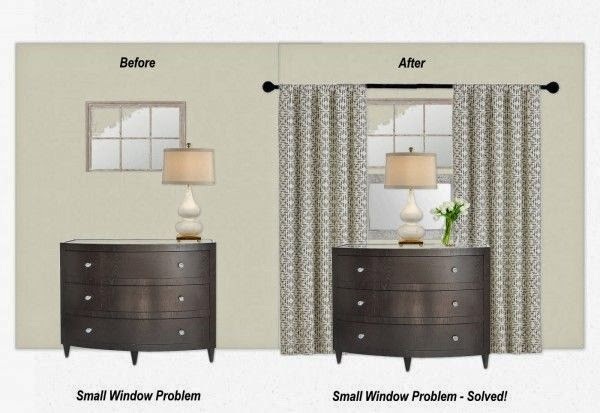 While a simple window treatment might solve your basement window woes, there's a whole lot more you can accomplish with a little creative thinking. Why accept mediocre when you can have spectacular! If you think of your window as one aspect of a vignette, you can create stunning spaces where the window becomes part of a larger design. This is a bit of a different way to consider tiny windows, but it leads to interesting ideas and solutions. 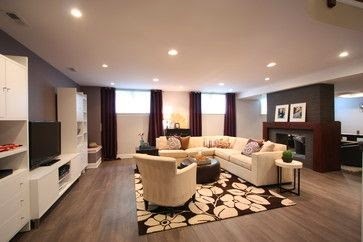 If you are lucky enough to build a space give careful consideration to the placement of windows in basement spaces. Depending on how your land slopes you can have sections where larger windows are possible. Centering main structural elements between windows creates interesting designs. A centered bed below a small window can do wonders to fill in the awkward space below. 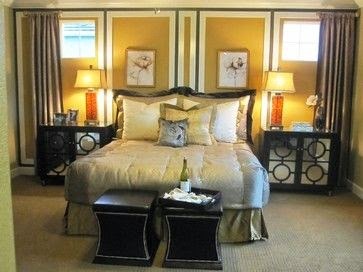 Hanging drapes that also frame the bed adds an additional layer of interest to the vignette. If centering your layout around a window isn't an option there are other ways to make those cramped windows look more important. Your next bet is to "fake it". This is a solution I love. A simple treatment with no additional details apart from the shutters. 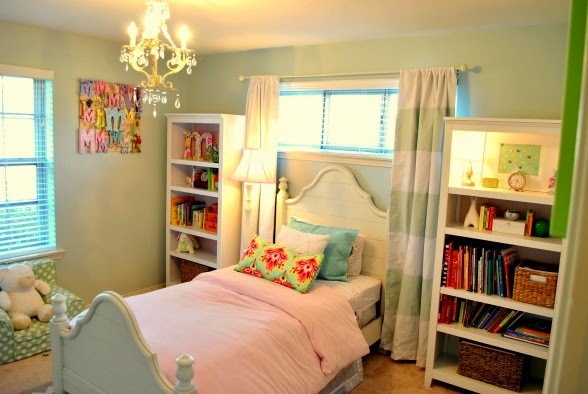 But layering with draperies as you can see below brings the whole space up a notch. Is that a shutter I see? 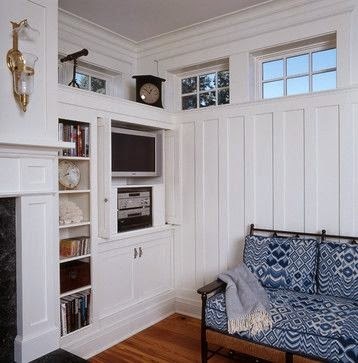 This shutter is added to the wall below the window to create a longer, more interesting area for the draperies to hug. Adding the table below this faux treatment finishes the look. You could also get the same effect with top down cellulars with an outside mount or even a woven blind attached permanently below the window. 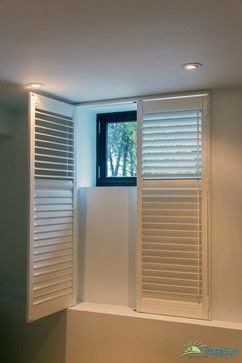 Shutters can be used very effectively to give the impression of a large window. 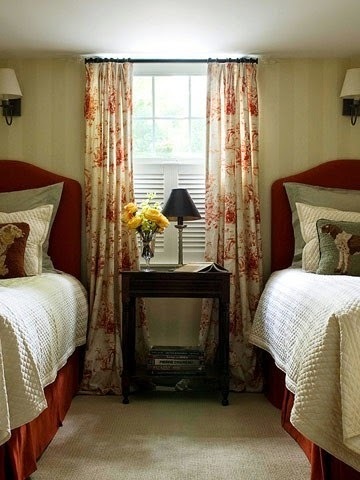 The drapes add a second layer of detailing and softness. No window at all? Don't let that stop you from having a spectacular space. Sometimes you can use high contrast to actually make a small window work in a space. It seems contrary to common sense, but it does work if you choose the right setting. If there was only one window in this room and it was smaller it would not look as spectacular. 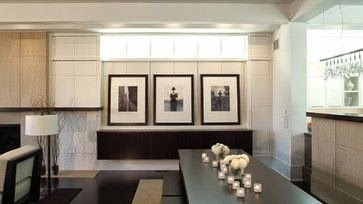 Of course, when using black it is important to have other black elements in the space to move your eye around. I think this space could be further enhanced by having something under each window. I am not a lover of the dark lines and the blank wall showing between them. Check out the next section for ideas to further enhance this contrasted look. Because basement windows are so high up on a wall, you have to deal with all that empty wall space below them. Am I the only one who is annoyed by this? If it bothers you too, there are several ways to solve this problem. How much do I love this space? Lots. It is fresh, well conceived with extra sleeping and the art work added below the windows visually enlarges each window by convincing your eye to read both as one unit. Many basements have a half wall created when the concrete meets the wood framing. 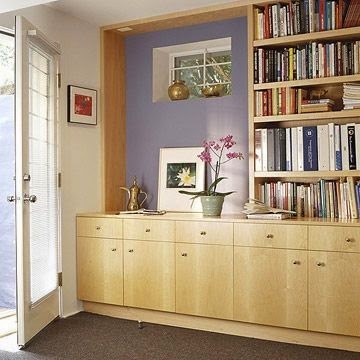 This space provides the perfect spot for art display but you just need to know how to use them effectively. This might be a good time to say never highlight this type of wall by painting it a different colour from the top portion because it chops the room in half and is not interesting! The power of standard repetition... same size, same colour and layered over repeated shapes. The repetition really works. I think this is a stunning space because of how the windows were treated. Isn't it well balanced and interesting? Doesn't a circular motif soften the look of this artwork? 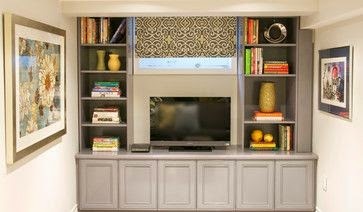 The dark frames relate to the accent wall pattern. I admit it, I am fussy. While I like this look, I want the art to be a tad smaller and less busy with all the books. An art work needs breathing space and low visual competition from what is surrounding it. This is an interesting solution for a small window. A second framed mirror was added below the window to fool the eye into thinking the window is much larger. Then a chest of drawers and a lamp was added to complete the look. 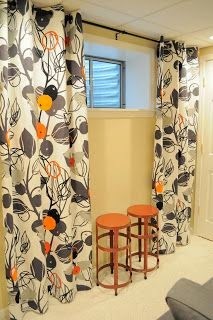 I love the stools and the drapery fabric. This is an excellent example of where a piece of art with vibrant oranges would work below the window or I might add a more substantial piece of furniture. A fantastic start. 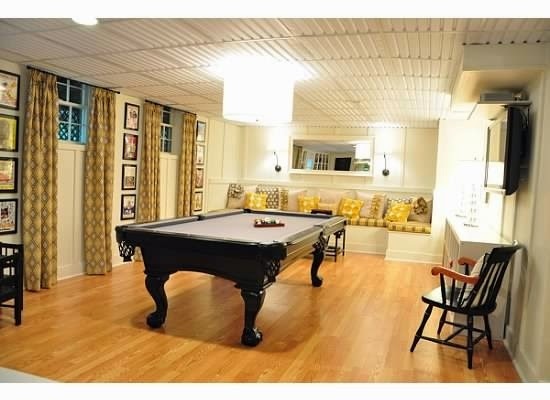 The two windows are dressed with drapes, the bed is centered, artwork has been added as well as furniture and lamps, and we have a new solution too - paneling which mimics the framing on the night tables. Keeping all elements the same size adds consistency to the wall and helps to blend the windows into the construction. And there you have it. 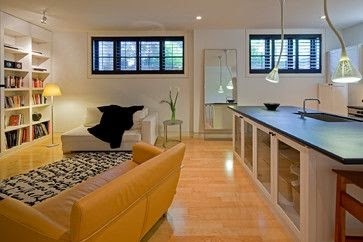 A collection of ideas from around the web that will ensure you don't have boring, small windows in your basement. Do you have a favourite from the ideas presented? I liked curtains more than the window...!! Nice interior designing and window..!! 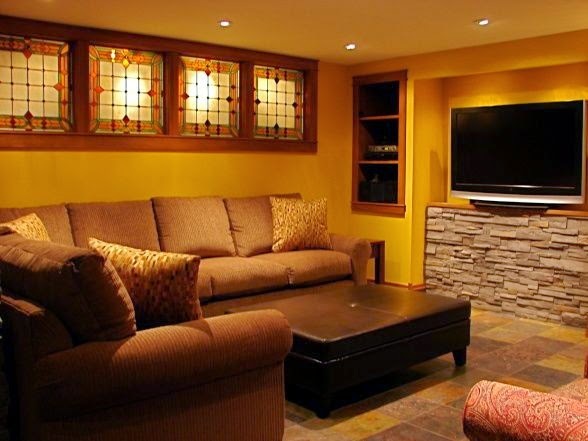 I loved to see it and I call it as nice basement remodelingidea.....!!!! Wow....these are really an awesome design for Basement. Love these ideas. Thanks for sharing this wonderful designs. 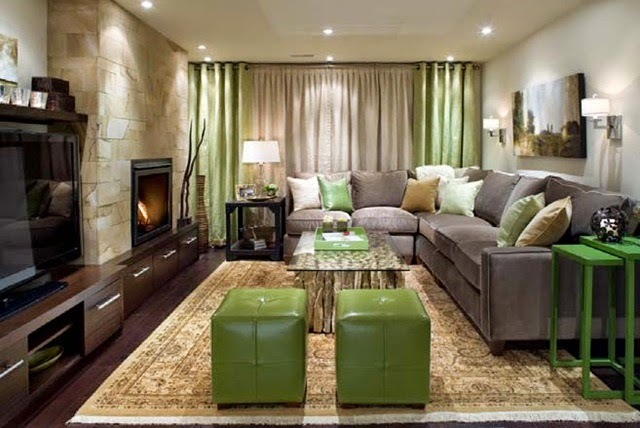 Windows are indeed focal points and you can't just leave as they are as they can hurt your interior's overall look. The correct coverings like shutters, blinds and curtains will really help as they also come with various colours and patterns. Having pretty furniture and art pieces around can contribute as well. 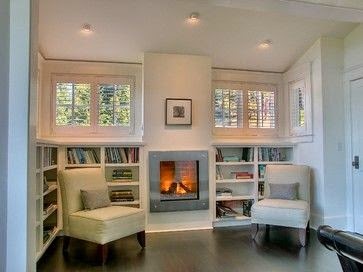 I love the new look of your living room with the fireplace and bookcases in the center of the windows. 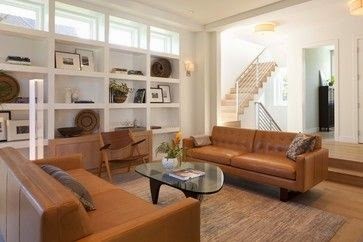 It gives so much charm to the room while letting in more light to the area, making it easier to read or enjoy sitting with others in the home. That is such an energy-efficient option.